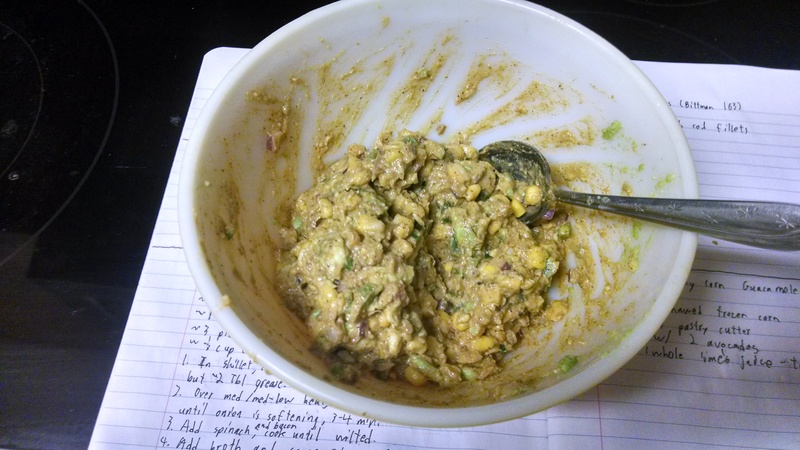 The taco is pretty much the official food of San Antonio, so I guess it’s appropriate that this is the first recipe I post, but it’s just what I pulled from the recipe jar this week. Both the tacos and the guacamole are adapted from Mark Bittman’s How to Cook Everything (10th Anniversary Edition). No cilantro was harmed in the making of this meal. 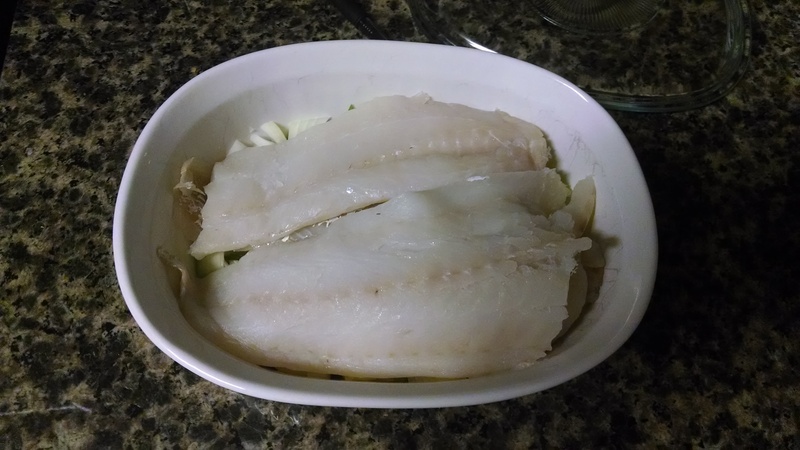 This recipe taught me that you can microwave fish, and nothing bad will happen to you. It’s pretty good, but it could use more flavor. I think future attempts will involve some lime juice and maybe garlic or something. 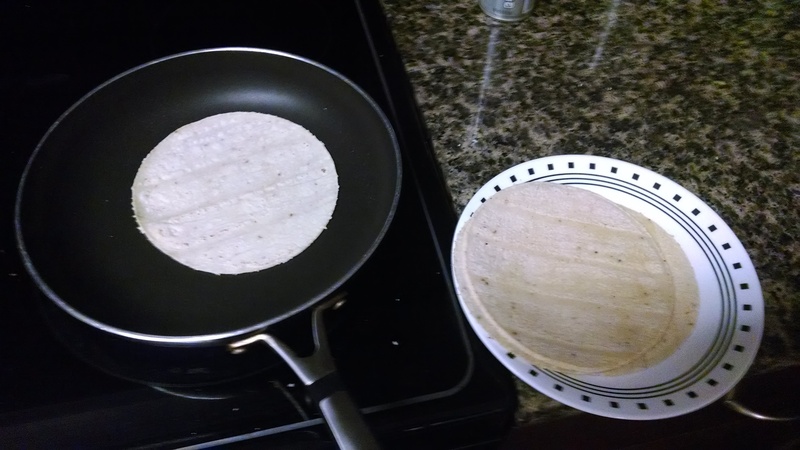 Also, I don’t usually get corn tortillas, but they really are better than flour for these. Makes: 3-4 servings. I will be eating fish for a while. Time: Supposedly 20 minutes. I wasn’t timing myself, but I think if I weren’t also making guacamole, that might be about right. 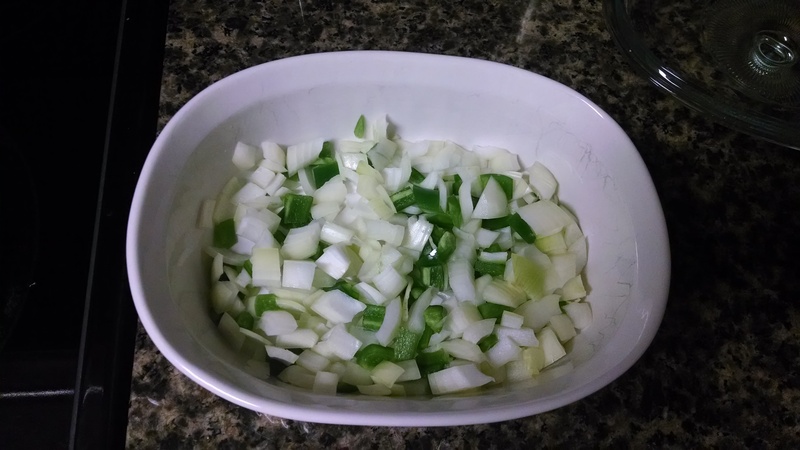 Put the onion and jalepeno in a microwave-safe casserole with a lid. 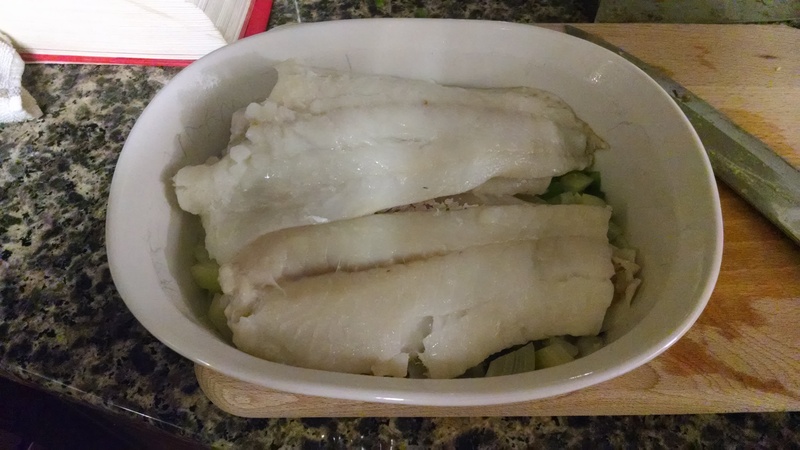 Add 1 tablespoon of water and put the fish on top. Sprinkle with salt and pepper. Next time I do this, I’ll probably replace the water with lime juice. Cover and microwave 4 minutes. Yes, microwave. While it’s cooking, heat your tortillas in a skillet. Assemble tacos. Be careful not to overstuff them. Don’t be a hero. My usual guacamole is pretty simple (avocado, onion, lime juice, and chopped tomato). 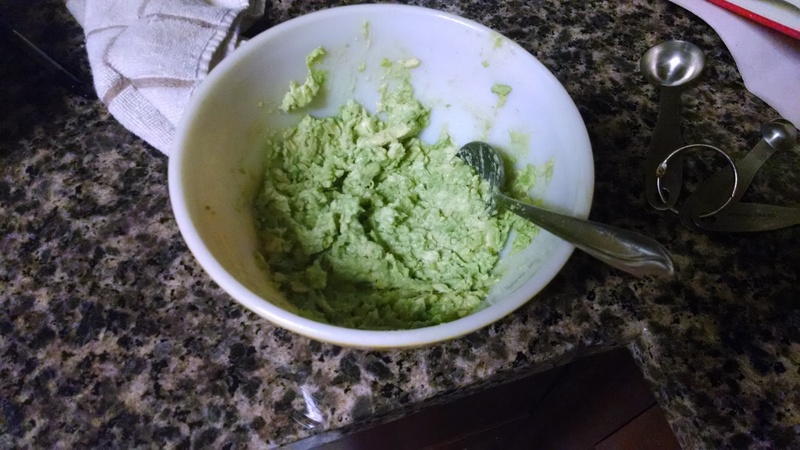 This is the weirdest guacamole I’ve ever seen/made. It’s kinda brownish because it’s got chili powder in it. It’s good though. 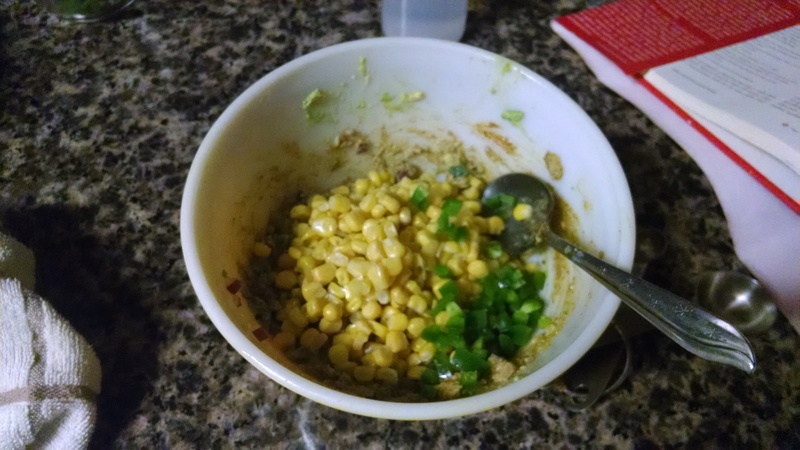 The corn gives it a sweet crunch, which is balanced by the mild heat of the chili powder and jalapeno. I went too heavy on the lime juice (a full lime). The original recipe says 1 Tbl. I’m saying 1/2 a lime. Also, the best description I’ve ever heard of how to tell if an avocado is ripe: Squeeze it a little; it should be as firm as a nose. 1 cup corn kernels. I used thawed frozen corn. Cut the avocados in half and remove the pits1. Scoop the flesh out into a bowl with a spoon. With a fork (I used a dough blender), mash up the avocado. Stir remaining ingredients into the avocado. If not serving immediately, cover with plastic wrap pressed to the surface of the guacamole with no air bubbles. Oxidation turns avocados icky. lol that guac does look like death. lime juice for everything! adding some smoked salt to the fish would be pretty good too. i’ve found that some matchstick radishes can also make the vegetable component a lot brighter. The fish is also good served over rice with the same toppings (raw shredded cabbage and salsa or hot sauce).